My sleeping room at the Sheraton Gateway was only a couple of doors down from the mbl room, and I was tempted to go down there, pound on their door and tell them, "Could you guys keep it down?" If you've ever seen mbl at an audio show, you know they like to crank the volume up to rave levels. 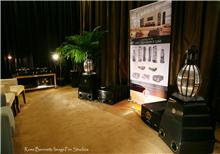 Still, I'm a big fan of mbl products because they offer astonishing sound quality (albeit at astonishing prices). AXPONA was no different, and I was treated to several obscure pieces of music that were all emotional and downright bombastic, yet incredibly detailed and very listenable.